Life. It begins and begins and begins. An infinite number of times. It is all beginnings until the end comes. Sometimes we know it and sometimes we do not, but at every moment life begins again. I didn’t want to put this book down. Something about it sucked me in right from the start. This is the story of Gus (Augusta) and Owen’s twenty-five year relationship and how it came to an end. From the beginning we know about Owen’s death, but we need to wait as Gus looks back on their life and tells us their story to find out how it comes about. … as one of my teachers used to say, you cannot see a landscape you are in. But you do begin to see it when you step away. Gus is a painter, Owen is a writer, and they have been living in a farm house in the country. They have not isolated themselves because they are artists, but because of their past and their determination to move beyond it. We learn about the ups and downs of their many years together. There have been mistakes, are still some secrets, but they have committed to stay together. Then Alison moves in next door, and everything changes for them. She breaks into their solitude and befriends them. Gus finds herself looking forward to spending some time with Alison each day, and begins confiding in her. Their lives become more and more entwined, and when Alison’s daughter, Nora, enters the picture things become intense. … now and then the universe just insists on changing your life in ways you didn’t ask it to. This novel is subtle in its suspense. It is mostly a portrait of a middle age marriage, but something about the storytelling compels you to keep turning the pages. Even though you know what is going to happen at the end, you don’t know how or why, and as you get closer, you start hoping that maybe the narrator is wrong about the ending. Maybe it will turn out okay after all. Here it was again. The fact that to be truthful can so often be both right and wrong. 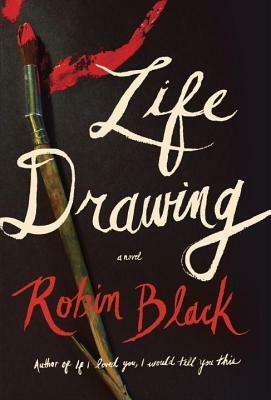 Besides the themes of marriage and friendship, Robin Black brings other elements into her book. Her characters have lived. They struggle with death, illness, family, trust, childlessness, and living with their own imperfections. How do any of us walk across a room without tripping over our own multitudes? There are often two conversations going on in a marriage. The one that you’re having and the one that you’re not. Sometimes you don’t even know when that second, silent one has begun. Trust and communication are explored in this book through both marriage and friendship. I wish you many more happy years! Thanks for commenting! Ooo, I’m a big fan of “why-done-its” and this is the second great review I’ve heard of this one. Sounds like it needs to go on my list! I think you would like it! And, it’s quick! Wow – this sounds like such an intriguing read! I love that you have to work your way through the novel to find out what happened to Owen. This book is definitely on my radar now. Great review! Thanks! I was surprised how much I liked it and didn’t want to put it down. I went through it fast! Oh, this sounds so good, Naomi. I am putting it on my list. I’ve been thinking about marriage a lot and looking for good novels on the topic (and what a bonus when the book is a page turner!). After almost 15 years, my own conclusion is that a good marriage is possible when both parties are willing to look at themselves and take responsibility for their own roles (instead of always thinking the problem lies with the other person). We’ve been up and down, I’m sure like any other couple, and I realized that we are still here because my husband is willing to say, “OK, I need to change this about myself.” I was a bit slower in that area, but this summer I recognized how I was contributing to our issues as well. Just being able to admit it has made things better. Thanks for the review! Have you read other good books on marriage? I have “The Amateur Marriage” at home which I should read one of these days…I think it chronicles one couple’s marriage over several decades. I actually thought of you, Cecilia, when I read this book, because we had talked about books similar to this before. Or about books with 40+ characters in them. If you hadn’t read my review I was going to mention it to you. If you end up reading it, let me know what you think! Good point about taking responsibility and not being so quick to blame our partners. It makes all the difference in the world to hear people admit their faults/mistakes and commit to finding a way to change, instead of becoming defensive. If I come across any more books I think you will like I will let you know (if you don’t read about it on my blog first)! Also, thanks for mentioning The Amateur Marriage. I will look it up! Another book has just come to my attention, called After I Do by Taylor Jenkins Reid, which is about a couple’s marriage through the first 11 years. The characters might be younger, but it seems to be getting good reviews. Just wanted to mention it to you! This definitely sounds like something I would read. I love books that work their way backwards to help you understand how things came to be. I liked that about the book, and so many other things! If you read it, let me know what you think! I have had this book for a while (I actually have two copies, because it was a delivery mistake) but thanks to your review I’ll be reading it sooner than I thought I would. Looking forward to it now. I hope you like it! And, you have an extra one for a friend!